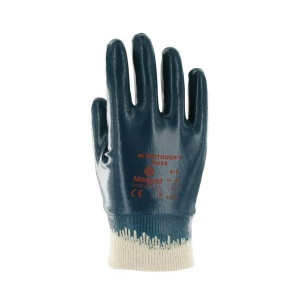 Constructed from a fleeced cotton liner with a full nitrile coating, the Marigold Industrial Nitrotough N650 Heavy-Duty Nitrile-Coated Gloves offer comfortable, durable and flexible protection. These gloves are a fantastic alternative to PVC and light leather gloves, and are ideal for a variety of applications within the automotive and construction industries. The N650 Gloves are suitable for use in oily and greasy environments, and will provide protection against abrasion and oil. They can be used for various applications, but are ideal for high-risk tasks in the automotive and construction industries. The table below shows the test results of the Nitrotough N650 Gloves according to EN 388 Mechanical Risk specifications. These gloves are available in a range of sizes, making them suitable for most users. Please consult the table below for details, then select the required size from the drop-down menu at the top of the page. The gloves have a length of 195 - 220mm.